Stephanie Land is a writer whose work has been featured in Vox, DAME, Mamalode, The Huffington Post, Literary Mama, Scary Mommy, and she is forthcoming through the Economic Hardship Reporting Project. 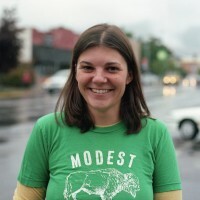 She lives in Missoula, Montana, with her two young daughters and their shelter dog and works somewhat constantly as a freelance writer. Follow her @stepville or through www.stepville.com.